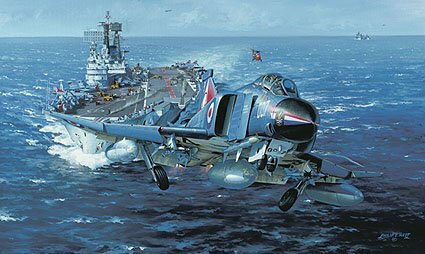 HMS Ark Royal IV - Flagship of the Flag Officer Aircraft Carriers - a mobile airfield and a most impressive sight as she launches a Phantom from one of her catapults. She had a standard displacement of 43,000 tons, a beam of 168 feet, and was 846 feet long. Ships company numbered 2,570 and her Air Group consisted of Phantom Interceptors, Buccaneer strike and Gannet AEW aircraft together with Wessex SAR and Sea King ASW helicopters. She served her Nation and the Royal Navy for 23 years and sailed 800,000 miles of valuable service, finally being decommissioned in 1979. Limited to only 400 prints worldwide: £90 (US$135) each, 25 Museum Edition £115 (US$173) plus 25 Artist Proofs £115 (US$173) and 50 Remarqued Prints £215 (US$323) A Certificate of Authenticity and biographical details on each signatory accompanies every print.